My wife, Kathy, and I joined one of her co-workers, Susan, at Tamarind, a Thai byob on South Street. There are so many restaurants in the area and Tamarind proved to be an excellent choice and we felt lucky to have obtained a reservation for a Saturday evening. The servers are all pleasant and knowledgeable about the items on the expansive menu. Lots of abstract art decorate the walls of this 40 seat restaurant. Knowing that our food choices would have a certain element of spice, I went with a wine that I felt was up to the challenge. 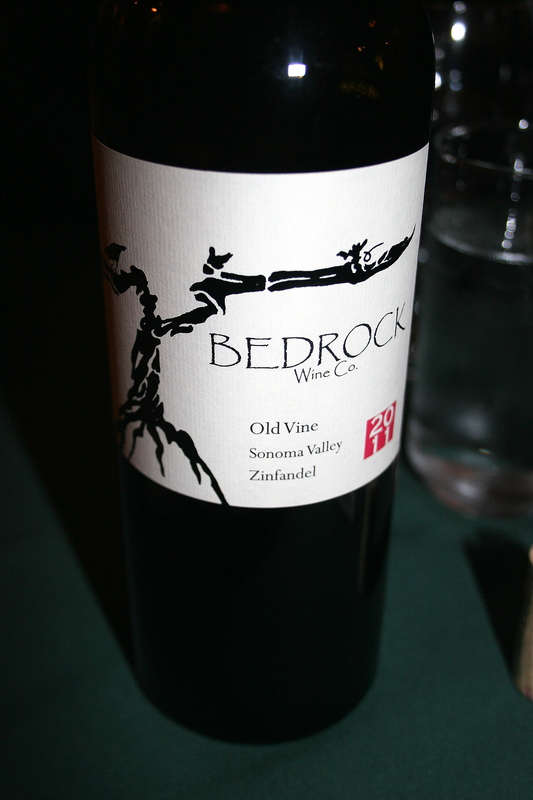 The 2011 Bedrock, Sonoma Valley, Zinfandel. Deep purple in the glass with an intense nose of blackberry and pepper. Plenty of balance between the fruit and acidity and a nice lingering hint of smoke and strawberries. This was nice match with tasty Thai food. 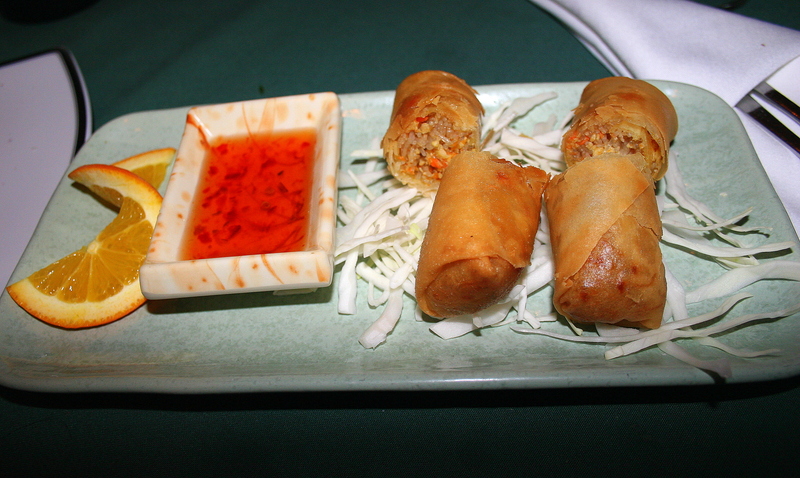 All three of us chose an order of Spring rolls to being our meal. Kathy and Susan went with the vegetable offering while I opted for the chicken. Both orders came with glass noodles, shredded carrots and 3 delicious rolls wrapped in a pastry shell ready for dipping into the house special sauce. These were an excellent choice as an appetizer. I ordered the Yum Nam Kaow Tod which, of course, virtually everyone knows is a chicken salad with herbs, lemon and red chile, tossed with red curry and crispy rice. (ok, I confess that prior to eating it I had no idea what it was). I’m not sure what the women thought of this dish but I thought it had a nice tang to it and was brightened by the addition of the lemon. We were enjoying the wine, food and conversation and were now ready for our main courses. 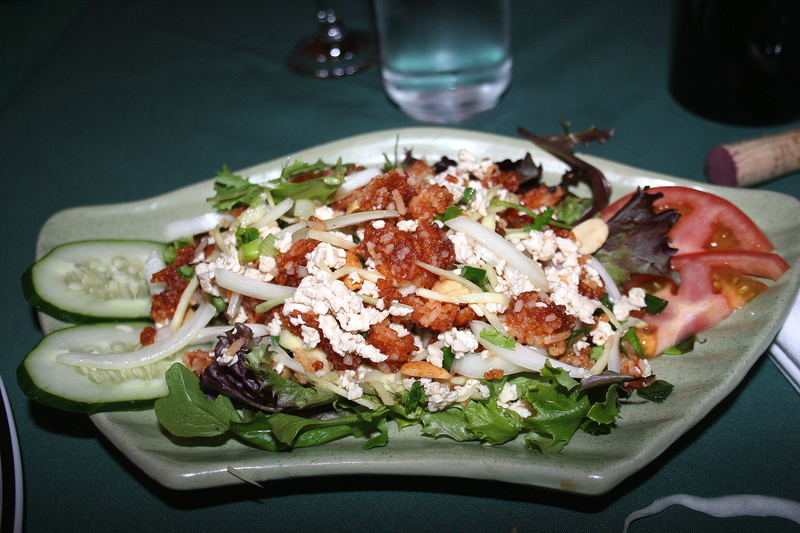 Kathy selected the Isan – Style Grilled Chicken. Isan style refers to a cooking style prominent in Northeast Thailand rather than the more commonly found methods of Bangkok. 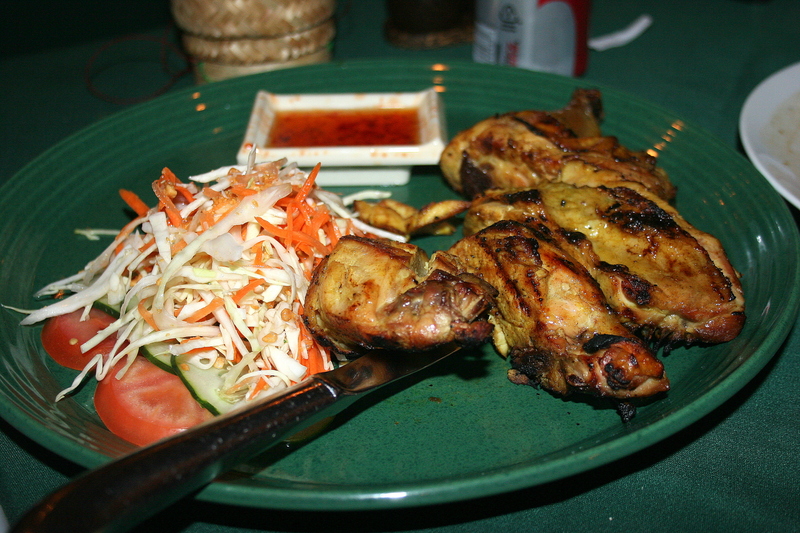 Her dish contained four nice-sized pieces of grilled chicken marinated in tumeric and coconut milk and served with sticky rice and Som Tum salad (thinly sliced fresh cabbage and carrots tossed with a spicy chopped peanut and lime dressing). Kathy thought her dinner choice was delicious. Susan had no hesitation in making the Roasted Duck with Vegetables her entree choice. 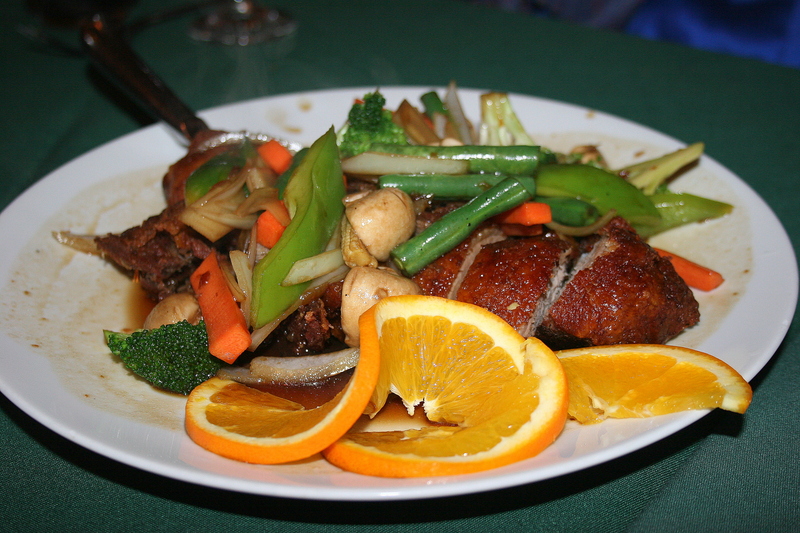 This dish consisted of half an oven roasted duck served with a sauce of sauteed ginger, sliced red onion and minced vegetables. It looked very good and Susan declared that the duck was nicely prepared and she had zero complaints about her dinner. I had considered a number of choices before finally settling on the Angry Salmon. I wanted to try to figure out just what was this salmon so angry about. 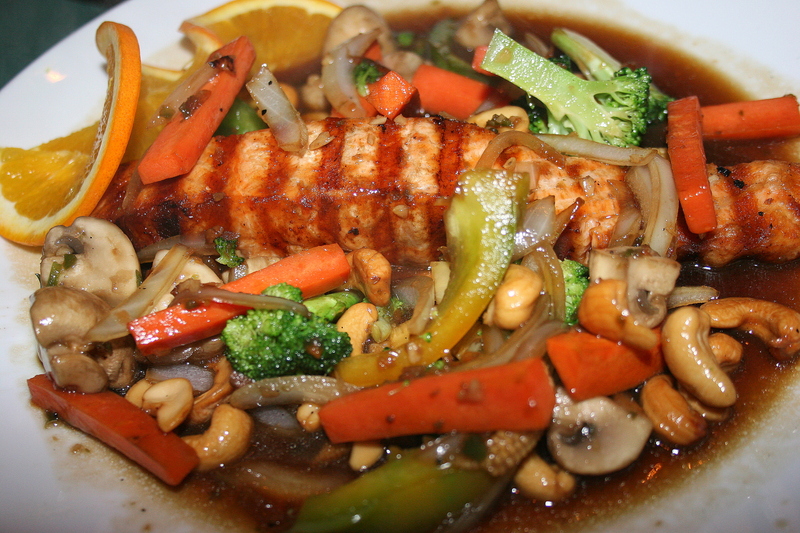 The menu describes the dish as Filet of Fresh Salmon, Red Pepper sauce. ANGRY! Our server explained that this salmon could be ordered on a scale of 2 to 7 with 2 being mildly upset to 7 indicating totally intense and unmitigated ANGER. That scared me a little and although I definitely wanted to feel some heat I was not sure I was ready for a fire-storm. I selected 5 and enjoyed my choice. I may have been able to go for 6 but the fish was nicely done and the sauce was spicy good. I am not a huge fan of all of the vegetables that topped the dish but that is my problem and not an indication of anything lacking in the presentation. 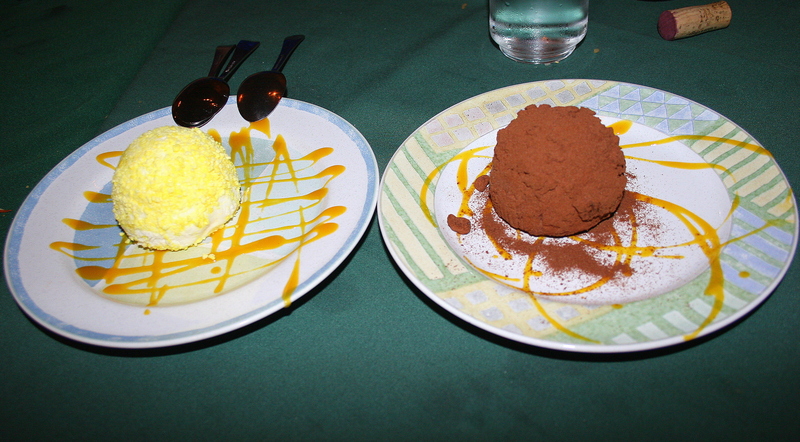 The three of us finished off our meal with both the Limoncello Truffle and the Chocolate Truffle. The sweet ball of gelato was the perfect ending to a very good Thai meal. 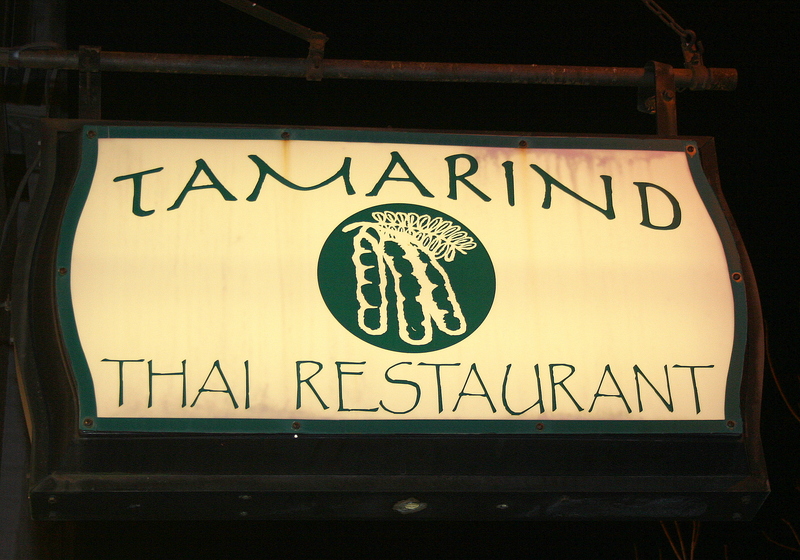 Tamarind is a nice spot for some good Thai food in the heart of the South Street Philly nightlife.